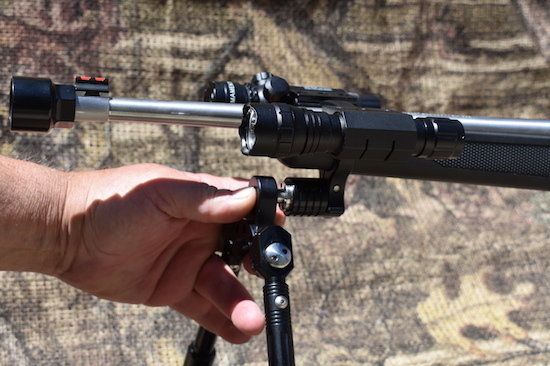 We went a bit further with our Ruger 1022 Carbine Bipod and Barrel Band system. First: Starting with the Barrel Band design. We move the rails up to the top and on center with the standard Ruger 10/22 carbine barrel. 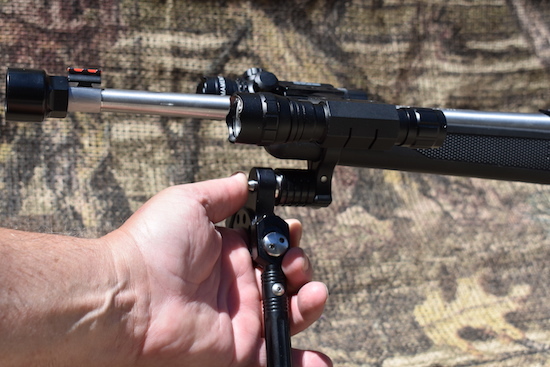 This provided more rotation range with the Pivoting Bipod we manufacture. Plus it takes less adjustment of your accessories to get sighted in. Second: We added the Standard Ruger 10/22 Carbine to the mix of Barrel Bands originally made for the Ruger TakeDown. Third: we added a ridged Bipod bridge. 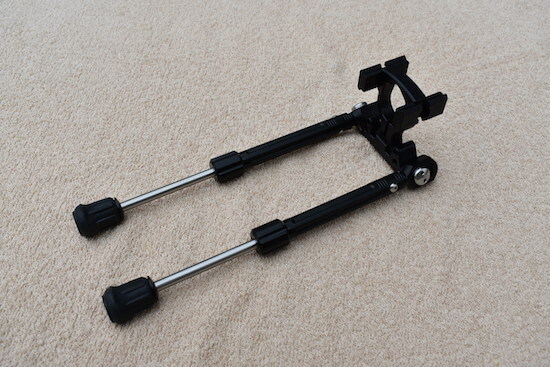 Same leg indexing as the Pivoting Bipod. 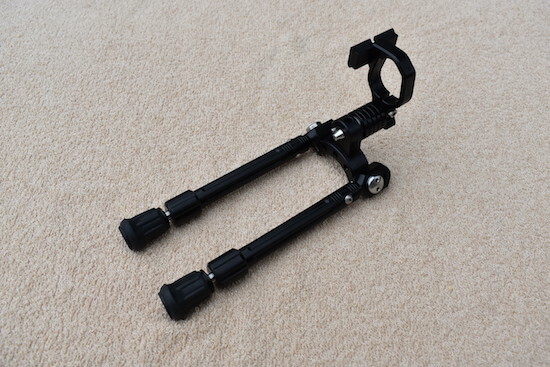 Fourth: We changed the leg design to the heavy duty Big Foot design. Outer leg tubes drilled and reamed from solid 5/8" diameter 6061 aluminum rod. Tumble finished for smooth satin finish. Everything Black Anodized to Mil-a-8625 standard. Leg tubes and collet nuts all fluted for positive gripping and weight. Extension legs are solid 5/16" diameter 304 stainless steel precision ground. To loosen and extend legs to the desired height just twist the bottom tube collet nut and extend. The compression collet system used a split collet and guide made from solid Peek rod. Chemical and temperature resistant and has unbelievable memory and will not deform over a lifetime of use. 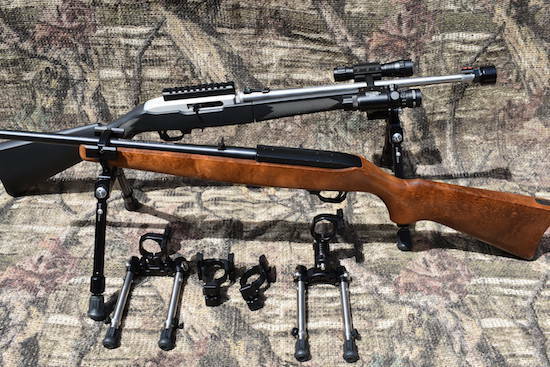 Ruger 1022 Carbine Bipod and Barrel band systems. Standard Carbines and TakeDown Carbines. Here is a Ruger 1022 Standard Carbine with 2 upper rail system and a ridged bridge Big Foot Bipod. With Legs extended. You can get all of these in 1 or 2 upper rail Barrel Bands. Here is the Ruger 1022 TakeDown Carbine with 2 upper rails and a ridged bridge Big Foot Bipod system. With legs extended. Here is the Ruger 1022 Standard Carbine with the Pivoting Bipod with 1 upper rail and the Big Foot bipod system. Here is the Ruger 1022 Takedown Carbine with the Pivoting Bipod with 1 upper rail and the Big Foot bipod system. 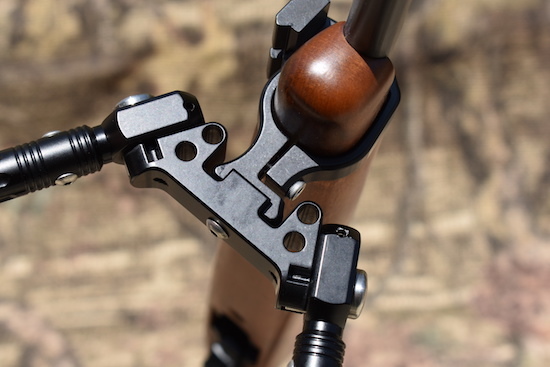 Here is a close up photo of a Standard Ruger 1022 Carbine with a Ridged Bipod and Big Foot bipod legs. 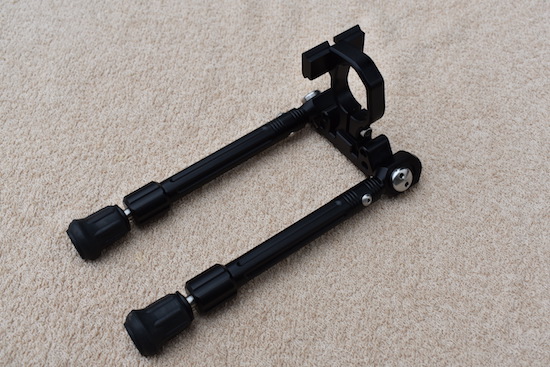 We manufactured custom super strong shoulder bolts for the pivot arms for this design. No corners were cut on this design. Light, strong and problem free function over a life time was our goal. 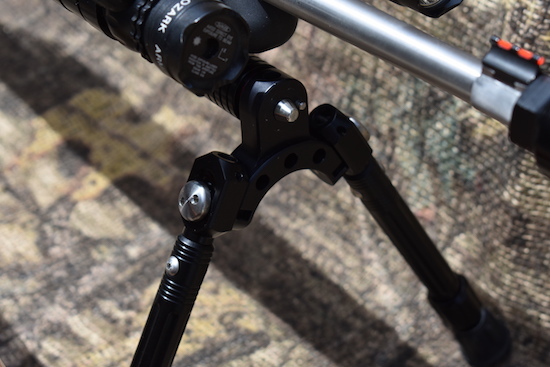 This design is a solid precision 4 way coupling of the barrel band and the Bipod. More ridged than a Picatinney coupling. Only one screw is needed. It's a direct coupling. Its amazing how strong this design is. 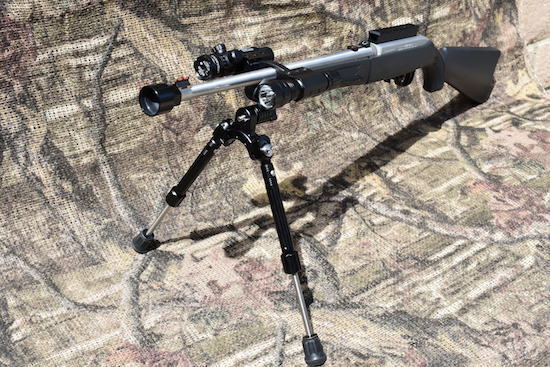 The standard Ruger 10/22 TakeDown with a Pivoting Bipod and 2 side upper rails. One green laser and LED light and "Big Foot" Bipod legs. This (photo) setup did increase the guns weight a bit. The Ruger pack had to be modified for the barrel accessories. I cut the divider seam sewing with a seam cutter on the barrel pouch of the pack and it fit perfect. The bipod fits the out side pouches. (SEE BELOW) Raising the rails to the top of the band increased the rotation of rifle left and right. The "Big Foot" legs are heavy duty. Minimum and maximum. 9.25 inches min to 11.75 inches max. 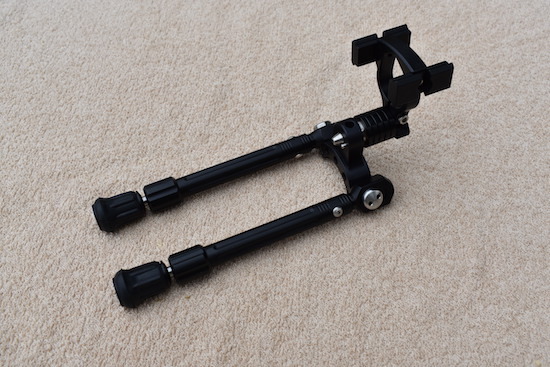 Same quick disconnect pivoting bipod system. Just push with your thumb and pop off the bipod. Takes about 2 seconds. You can install and disconnect it with you eyes closed. The bipod pops off the center pin. RUGER 10/22 CARBINE BARREL BAND AND BIPOD, 2 TOP RAILS. Price: $139.99 Plus shipping USPS Flat Rate $7.50 CALIFORNIA Destinations 8.75% Sales Tax. 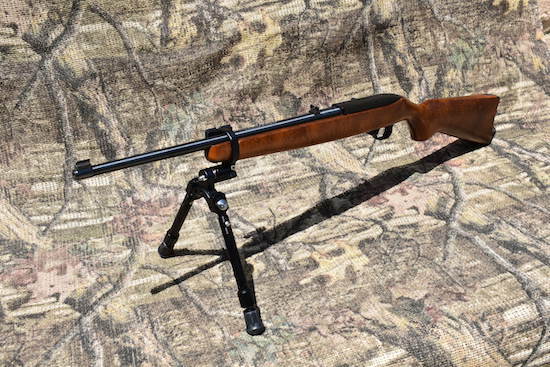 RUGER 10/22 CARBINE BARREL BAND AND BIPOD, 1 TOP RAIL. Price: $129.99 Plus shipping USPS Flat Rate $7.50 CALIFORNIA Destinations 8.75% Sales Tax. 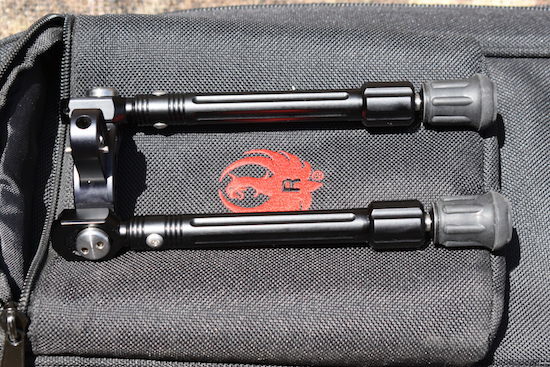 RUGER 10/22 CARBINE BARREL BAND AND PIVOTING BIPOD, 2 TOP RAILS. Price: $159.99 Plus shipping USPS Flat Rate $7.50 CALIFORNIA Destinations 8.75% Sales Tax. 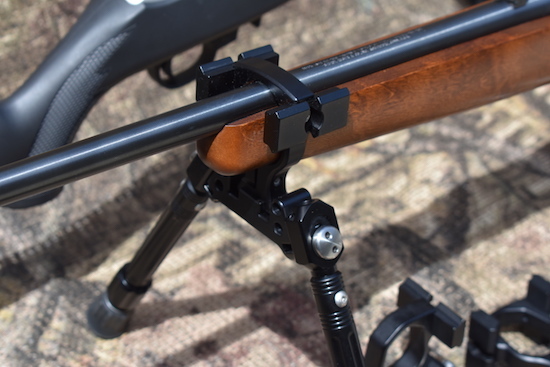 RUGER 10/22 CARBINE BARREL BAND AND PIVOTING BIPOD, 1 TOP RAIL. Price: $149.99 Plus shipping USPS Flat Rate $7.50 CALIFORNIA Destinations 8.75% Sales Tax. 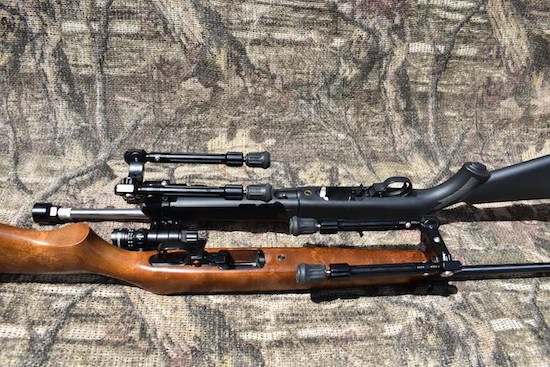 RUGER 10/22 TAKEDOWN BARREL BAND AND BIPOD, 2 TOP RAILS. 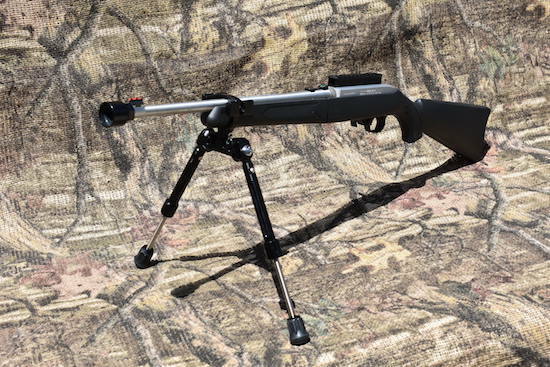 RUGER 10/22 TAKEDOWN BARREL BAND AND BIPOD, 1 TOP RAIL. 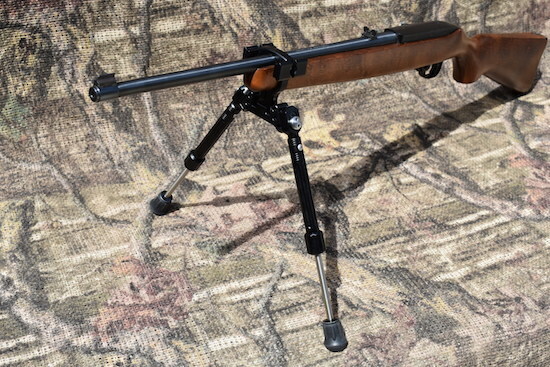 RUGER 10/22 TAKEDOWN BARREL BAND AND PIVOTING BIPOD, 2 TOP RAILS. 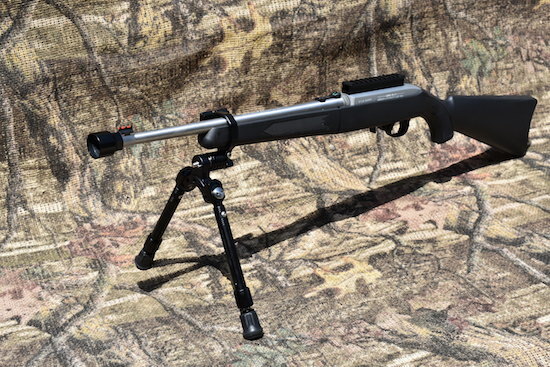 RUGER 10/22 TAKEDOWN BARREL BAND AND PIVOTING BIPOD, 1 TOP RAIL.